New Belgium Shift | Drink. Blog. Repeat. 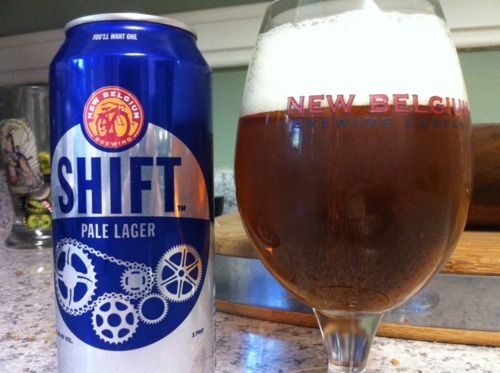 I’ve talked before about how New Belgium has a pretty good track record with me, and that continued with Shift, their new and much-hyped pale lager. With Saturday being National Session Beer Day, I figured it would be a good time to try out something on the lighter side. Shift pours a gorgeous crystal clear straw yellow color. There was tons of carbonation coming up from the bottom of the glass, where the nucleation site is on the New Belgium goblet. There was a thick, creamy head on top, about two fingers worth and it lingered for a while. A really nice looking beer. On the nose is grass with a little bit of banana and some spice. It’s kind of a richer, thicker scent to it. A bit malty on the nose but a slight hint of hops too. The taste is very clean and smooth. There’s a little bit of hop on the front. It’s smooth throughout the mouth, with that characteristic biscuity malt taste New Belgium has in all its beers. A bit floral, and there’s kind of a grassy flavor it. Slight bitterness on the back from the malts. I’m not the biggest fan of lagers, but this is a step up for the style. It’s crisp and clean, but has a lot of depth to it, and would be a perfect lawnmower beer.